We do accept credit card payments via phone. Call 906-884-4151 to make a payment. You have the option to set-up auto pay on your account. To do so, please contact the office at 906-884-4151. To get everything activated a routing number, account number and voided check is necessary. make equal monthly payments of 1/12 of any past due bills. your household income is at or below the 150% of poverty level shown in the Income Guidelines chart (see chart below). Senior citizen members (65 or older) who participate in the Winter Protection Plan are not required to make specific payments to ensure that their service will not be shut-off between Nov. 1 and March 31. However, seniors are encouraged to pay whatever they can during the winter so they will not have large, unmanageable bills when the protection ends. Note: All members 65+ are eligible regardless of income. Members are responsible for all electricity used. At the end of the protection period, participants in the plan must make arrangements with the cooperative to pay any money owed before the next heating season. qualifies based on alternate guidelines including household income, exemptions, and heating costs. additional exemptions are available for seniors, disabled claimants, or claimants with 50% or more of their income from unemployment compensation. If you qualify, you may receive assistance to help pay for your winter heating bills. Forms are available mid-to-late January wherever tax forms are provided, or from the Michigan Dept.of Treasury (517-636-4486, or michigan.gov/treasury). 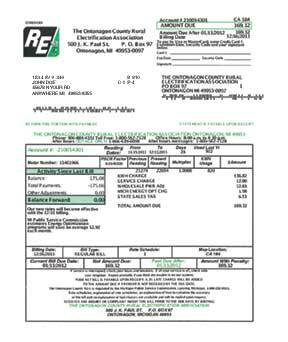 The Home Heating Credit claim form must be filed with the Michigan Dept. of Treasury before Sept. 30, 2014. The Earned Income Credit (EIC) is a refundable federal income tax credit for low-income working individuals and families who meet certain requirements and file a tax return. Those who qualify will owe less in taxes and may get a refund. Even a person who does not generally owe income tax may qualify for the EIC, but must file a tax return to do so. If you are married, you must file jointly to qualify. To file, fill out Form 1040 or 1040A and attach the EIC. For tax year 2013, a taxpayer may claim a Michigan earned income tax credit equal to a percentage of the federal earned income tax credit for which the taxpayer is eligible, if any. The Michigan credit will assist working families struggling to keep up with rising costs. Watch for additional information in the 2013 Michigan income tax booklet or visit the website at www.michigan.gov/treasury. You do not have to be a client of the DHS to apply for help through the SER. This program is available year-round, subject to the availability of funds, to assist low-income households that have a heat or electric past due notice, shut-off notice or a need for deliverable fuel where the fuel tank is at or below 25% of its heating fuel capacity. If you receive a DHS cash grant, you may vendor part of that grant towards heat and electric bills. Contact your DHS caseworker for information on the advantages of vendoring a cash grant. For additional information, contact your local DHS office or call the Home Heating Hotline, at 1-855-275-6424. Michigan’s Weatherization Assistance Program (WAP) is a federally funded, low-income residential energy conservation program. WAP provides free home energy conservation services to eligible low-income homeowners and renters. These weatherization services can help you reduce your energy use and lower your utility bills, thus creating a more self-sufficient household. If you qualify, a trained inspector will assess your home and determine which conservation measures will be the most beneficial for you. Weatherization steps may include caulking and adding weather stripping; wall, basement and attic insulation and ventilation; and an Energy Star refrigerator and furnace. Eligibility is based on your household income being at or below 200% of the federal poverty guidelines. If you participate in the Family Independence Program administered by the Department of Human Services, Food Assistance Program (FAP), or receive Supplemental Security Income, you automatically qualify for this program. Contact your local Community Action Agency for more information. Go to www.mcaaa.org website to find the community action agency in your area. You are protected from service shut-off for nonpayment of your natural gas and/or electric bill for up to 21 days if you or a member of your household has a proven medical emergency. You must provide written proof from a doctor or a notice from a public health official stating that the shut-off of service will aggravate the existing medical emergency. The certificate must identify the medical emergency and specify the period of time during which the shut-off will aggravate the emergency. If you or a member of your household requires home medical equipment or a life support system, you must provide documentation from a physician or medical facility identifying the equipment or life support system and certifying that an interruption of service would be immediately life threatening. If shutoff of service has occurred without any postponement being obtained, the utility shall restore service at no cost to the customer for 21 days. The medical emergency form can be extended and shutoff of service can be postponed for a total of 63 days in any 12-month period per household member. Annually, the utility is not required to grant shutoff extensions totaling more than 126 days per household. If you or your spouse is the customer of record with the utility company and either of you is called to full-time active military service by the President of the United States or the Governor of Michigan during a time of declared national or state emergency or war, you may apply for shutoff protection from your electric or natural gas service for up to 90 days. You may request extensions of this protection by re-applying with your electric or natural gas company. Your utility company may request verification of active duty status. At the end of the active duty period, you must notify the utility company of your status. You will still be required to pay for the electric and natural gas service used during your participation in this program and your utility company will set up a payment plan for all past due amounts to be paid within twelve months.